You are here: Home / Raw Islam / Raw Islam 42: Can Islam Work With Current Issues and Topics? Raw Islam 42: Can Islam Work With Current Issues and Topics? 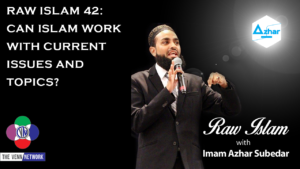 This week on the Raw Islam Podcast with Imam Azhar– a 2017 Podcast Award nominated podcast, our question of the week can Islam work with current issues and topics? B.C. Dodge starts the show by introducing the new Venn Network t-shirt, which you can own by heading over to Amazon.com. When you buy one of these shirts you help, not only support the network, but you also help support the hosts. The Venn Network is growing, and it is only with support from listeners – like you – that we can reach those in need of hearing our message! Imam Azhar reminds our audience that Raw Islam is a topical show. This show does not preach, we do not condemn, we bring you weekly topics through an Islamic filter. Because, believe it or not, there is an Islamic perspective on many of the things that are going on in the world around us today. Part of the issue around is this is that there are many “Cultural Muslims” that have separated Islam from the rest of the world. The fact of the matter is that as a Muslim, you can’t do “your Muslim thing,” and then go out into the world. You need to be living example of your faith. To prove his point, Imam Azhar will perform the amazing feat by pulling in facts and information about the Super Bowl, The State of The Union Address, and the biggest dip the Dow Jones in years and show you – well rather tell you – how Islam pertains to each one of them. Starting with the Super Bowl – Breitbart put out a tweet that, as best we can figure, was supposed to be funny. And in the Tweet they wrote that “Well ‘lil Muhammad, back when the kuffar ran things, they stitched up filthy pig skins, moved them around painted lines, and shoved each other. There was secular music and alcohol – A Very haram affair!” This sends B.C. into a tailspin about how pork is not kryptonite to Muslims. Muslims are simply instructed not to eat it. Imam Azhar brings things back to center as he address the peaceful celebration in Philadelphia, what seemed to be the longest State of the Union in history, and yes one of the biggest dips in the stock market in quite some time. Make sure to subscribe to this Venn Network production – Raw Islam with Imam Azhar Subedar. This is surely one of the best podcasts to subscribe to if you are looking for facts about Islam and if you want to know what Islam is all about. The Raw Islam Podcast delivers important information about Islam to you weekly, so make sure to subscribe to this Muslim Talk show that isn’t just for Muslims! Do you have questions for the Imam or thoughts on the show?